Saudi Foreign Minister Adel al-Jubeir rejects Netanyahu's call to update Arab Peace Initiative. Saudi Arabia's Foreign Minister, Adel al-Jubeir, on Friday said the Arab Peace Initiative is the best solution for the Israel-Palestinian Authority (PA) conflict, and rejected Prime Minister Binyamin Netanyahu's demand that the initiative be "updated" to reflect the changes that have occurred in the Middle East over the past several years. The initiative, unveiled in 2002 and re-endorsed at the 2007 Arab League summit, says that 22 Arab countries will normalize ties with Israel in return for an Israeli withdrawal from Judea and Samaria. Responding Friday to Haaretz's question at a press conference held after the peace summit in Paris, al-Jubeir said, "Why should we change the Arab Peace Initiative? I believe that the argument the Arab Peace Initiative needs to be watered down in order to accommodate the Israelis is not the right approach." The Saudi minister stressed noted that the Arab Peace Initiative was never taken off the table and that it has been approved by Arab nations several times since its creation in 2002. "It is on the table and it is a solid basis for ending the conflict," he said, according to Haaretz. "We and the rest of the world believe that the Arab peace initiative is the best option to resolve the conflict and we hope that this wisdom prevails in Israel too and that the Israelis would accept this initiative." "The Arab Peace Initiative is very clear and in line with international resolution and it has all the elements needed for a final settlement ... The Arab Peace Initiative provides Israel with a lot of incentives and it's for the Israelis to accept it," added al-Jubeir. 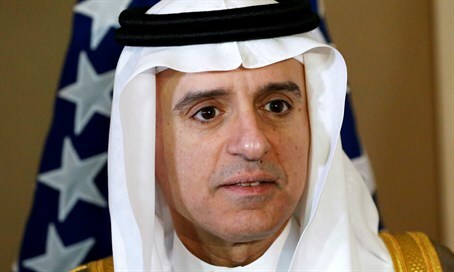 Al-Jubeir’s remarks on Friday appear to suggest that recent reports indicating that Arab countries were willing to discuss changes to the initiative are false. Before the Paris peace summit, the Saudi Foreign Minister downplayed Netanyahu’s remarks about the initiative. “It's a little early for one to assess the seriousness of the Israeli side to begin talks based on the Arab Peace Initiative,” he said. "When the Israeli prime minister spoke about it, he spoke about some clauses that he considers positive, not about accepting the initiative as the basis of talks," al-Jubeir added.